Imagine what you could build in a Google Spreadsheet that automatically pulls in your daily financial transactions and balances. Tiller is the only service that automatically feeds data from bank accounts, credit cards, investments, and loans into Google Sheets. It makes working with a financial spreadsheet 10x faster. No more logging into multiple accounts to download transactions. No more uploading CSV files. 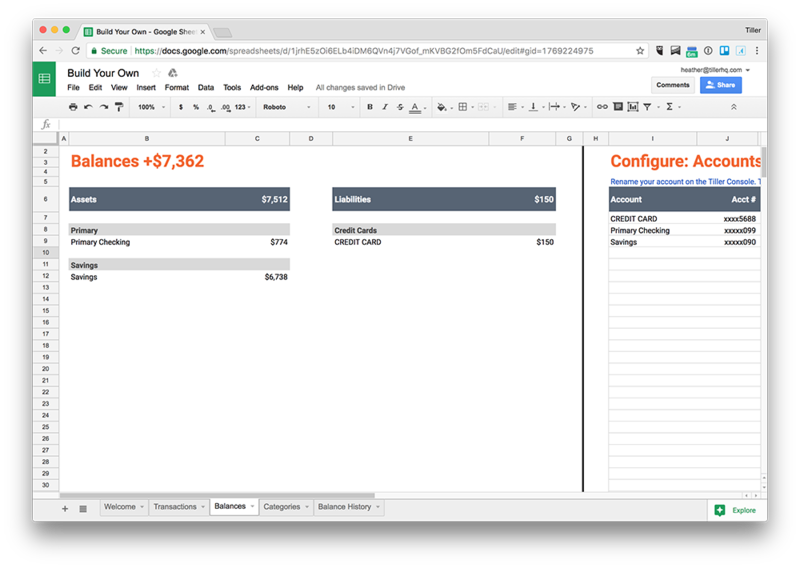 Every time you open your Google spreadsheet powered by Tiller, you'll find your daily transactions neatly autofilled for you. The Build Your Own template takes this idea further. It's a blank slate for people who want to harness our financial feeds to design their own ultra-customized financial spreadsheet. A custom spending tracker based on your actual transactions. A net worth dashboard with your most important metrics, updated daily. An income tracker pulling balances from multiple types of accounts. And anything else you can imagine in a Google spreadsheet. Tiller automatically feeds your transactions and balance history each day. Customize your Groups and Categories on the Categories sheet. Categorize your spending on the Transactions sheet every few days.